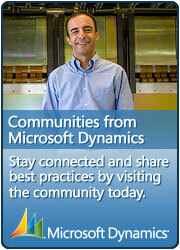 I saw this video from Microsoft about reporting in CRM 2011. I was interesting to see the new ability to create reports based on Fetch Xml. I also really liked the button to retrieve the fetch xml button on an advanced find. This functionality will mean it will be easier for people to create reports because they get the contents using an advanced find. The video is 10 minutes long but this is time well spent because they walk through making a report from scratch. Microsoft have added some new sample code which is very useful. The first thing I noticed was they have added some examples of how to edit the metadata using Jscript and how to connect using soap methods. I was wondering where this code was. I didn’t want to use the old CRM 4 methods because they will not be supported in the long run. Added a new section about using the portal development toolkit to build a Web portal that interacts with Microsoft Dynamics CRM 2011 . SDK\Walkthroughs\Portal Added new assemblies, tools and samples for Developer Extensions and the Portal Developers Guide. So what portals have been released and you can find them in the Microsoft Dynamics Portal and they are basically an upgrade of the CRM 4 accelerators. Sticking to promoting the cloud, these portals work on all versions of CRM. The one thing I have noticed is the Customer Portal has 4 review getting 3.5 rating (out of 5) and the partner relationship portal has no reviews which is quite surprising. Looking at the reviews of the customer portal, all of the people had problems installing the portal, so it might be worth waiting until some of the problems are smoothed out. Customer Portal for Microsoft Dynamics CRM provides businesses the ability to deliver portal capabilities to their customers while tracking and managing these interactions in Microsoft Dynamics CRM. Functionality includes lead generation, service scheduling, case management, event calendar, product registration, self-help knowledge base and content management. Customers can turn this functionality on or off depending on their specific requirements. Note, this solution includes all functionality from the Portal Integration, eService and Event Management accelerators that were released for Microsoft Dynamics CRM 4.0. The Partner Relationship Management (PRM) Portal allows businesses to use Microsoft Dynamics CRM to distribute sales leads and centrally manage sales opportunities across channel partners. It provides pre-built extensions to the Microsoft Dynamics CRM sales force automation functionality, including new data entities, workflow and reports. Using the PRM Portal, companies can jointly manage sales processes with their channel partners through a centralized Web portal, as well as extend this integration to automate additional business processes.